Some of us in Portland had been questioning the goals of J Street, which has butted into the goals of AIPAC, who had been the only group acting as advocates of Israel. We feel that Israel has the right of deciding what is best for them. Though AIPAC members are made up of Jews and Gentiles, we are not living in Israel, so cannot tell them what to do anymore than people in England can tell the USA how to run their affairs. I found out that J Street was backed financially by a very leftist billionaire, George Soros. "The initial support of J Street came from multi-billionaire George Soros, who for a brief time was associated with the organization. 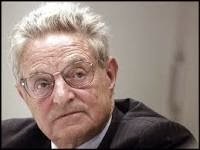 Soros pulled out before the initial launch, so as not to negatively affect the group. In September 2010 it was revealed that despite the organization's denials, Soros secretly funded the group." I note that Wikipedia left out the fact that Soros is Jewish and that he's a Holocaust survivor from Hungary. They did go on to tell how he broke England's bank, though. "He is known as "The Man Who Broke the Bank of England" because of his short sale of US$10 billion worth of pounds, giving him a profit of $1 billion during the 1992 Black Wednesday UK currency crisis." To me he is known as the man who started and funded J Street. It seems he wants to pull the strings as to how Israel acts or doesn't act and he and his cohorts think they know better than people who live there. We even had a public debate between J Street and AIPAC here in Portland, and they seemed off key in my opinion, just more wary, taking a slightly different approach in how to appeal to people. They tried to impress us on how they really backed Israel. Ha! Telling Kerry and Obama that Israel shouldn't expect to be recognized as being Jewish is NOT backing our one and only Jewish state in this world! "According to Caroline Glick, deputy managing editor of The Jerusalem Post, J Street is anything but pro-Israel: "Through their actions, J Street and its allies have made clear that their institutional interests are served by weakening Israel. Their mission is to harm Israel's standing in Washington and weaken the influence of the mainstream American Jewish community that supports Israel." Obama is supporting J Street, or rather J Street is made up of Obama supporters. It's hard to tell which is which. Now J Street has hit below the belt in what they are advocating and are taking an extreme opposite view that Israel and I take. Let it be remembered that only Israelis are citizens of that country. Being Jewish in the USA or anywhere else does not give you the right to dictate how Israel is to live. It's Israelis' lives that are on the line by living there. It's they that knows exactly what is going on; far more than any American depending on their city newspapers for information. Israel is also a democratic country by itself. So the gloves are off and I'm sharing some information from Steven Plaut through friend Ziegelman. What gives me the right to say such things? I lived in Israel from 1980 to the very end of 1985 and became a citizen of Israel, so I have dual citizenship. I've never voted since leaving, but did when I lived there, though I do now have that right. I know what was going on there every minute of those 5 years and know that very little of it ever reached Portland, Oregon's Oregonian newspaper, as I had my mother living there. Then, I didn't share half of what I was experiencing because I didn't want to worry her. Since then I've learned that journalism reporting is still very politically-driven. So are groups. "1. The headlines are shrieking that two major American Jewish organizations are denouncing Moshe "Bogie" Yaalon for his criticism of American policy and demanding that he apologize. Haaretz and leftist Ynet are giddy in delight. But just who are these two "American Jewish organizations." The first is the National Jewish Democratic Council, which is simply the name of the pro-Obama group of Jews who are active in the Democrat Party. It is run by Rabbi Jack Moline, a buddy of Rahm Emanuel and initiator of the group (Pseudo-) "Rabbis for Obama.". It is a badge of honor for Bogie that these folks are attacking him. In a development that is not sending shockwaves through the pro-Israel community, the “pro-Israel, pro-peace” advocacy group J Street has declared its support for the Palestinian refusal to recognize Israel as a Jewish state. Netanyahu, he says, must drop his insistence that Abbas recognize Israel as a Jewish State because “it is simply unrealistic and unreasonable to expect any Palestinian leader to consent” to such a demand. J Street’s advocacy for the Palestinian refusal to recognize Israel as a Jewish state follows a nearly unbroken period of advocacy for Palestinian and Iranian interests since the group’s founding in 2008. J Street took the Hamas position on Israel during Operation Cast Lead later that year, accusing the IDF of war crimes and promoting the discredited Goldstone Report. It lobbied for the Iranian regime’s position against Iran sanctions. It defended the terrorists who attacked IDF soldiers on the 2010 Gaza flotilla. J Street also took the Palestinian and Arab League position on a UN Security Council resolution on Israeli settlements in 2011." J Street says they have 180,000 members. There are 6 million Jews in the USA. What hurts is that Jews are less than 1% of the world population. We are a very individualistic thinking population, made up of a lot of leaders, not followers. When we have AIPAC, who backs Israel, why divide up and have an opposing group like J Street that harms Israel? It harms very much when it goes against what Israel says and does, and that's what's happening. It's the USA that have been Israel's one supporter in this world, and here J Street is causing this country to GO AGAINST ISRAEL. This is the biggest SHUNDA that Jewish people can do to their brothers and sisters. Remember our history of when King Solomon died, Israel divided up into Israel and Judah, and being in two corners, were overcome by the Assyrians and then the Babylonians which led to being taken by the Romans. Dividing and not studying the issues can lead to the fall of little Israel today. We cling to the hope that G-d is watching out for Israel, because it's for sure that J Street is not helping. It's been enough that so many have been against Israel and now we have Jews as well against her. For shame !